I know one person who should really know the answer, let’s see if they respond! If you have a guess, post it in the comments here. I’ll update with the answer later this week. It’s actually pretty cool. 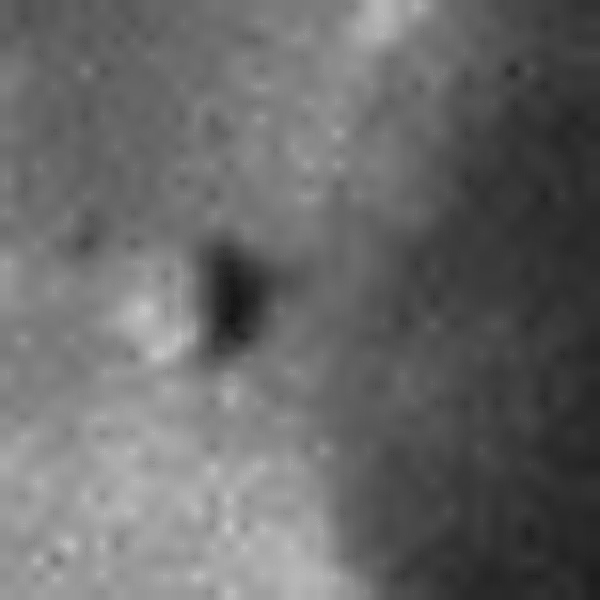 And like Nancy Atkinson always says, give yourself extra points if you can guess the spacecraft responsible for the image, but don’t give overly-detailed explanations or links so everyone has a chance to guess. Good luck! Most of you were on the right planet, and those of you who guessed Mars rover – congratulations! 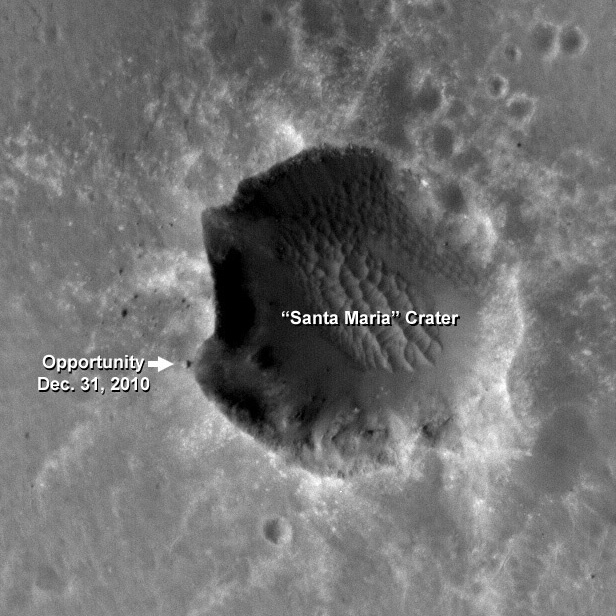 This is indeed a photo of Opportunity on the edge of Santa Maria crater, taken by the Mars Reconnaissance Orbiter’s HiRISE camera on December 31, 2010. I zoomed in quite a bit, so it’s hard to make out much detail on the rover but I’m thinking that we can see sunlight on the rover’s three right wheels as well as the dark-colored solar panel in the image above. Below is the original image, labeled by the HiRISE team at the University of Arizona. And for updated images from Opportunity be sure to visit The Road to Endeavour, Stuart Atkinson’s dedicated blog documenting the rover’s ongoing trek across the Martian plain. Thanks for participating in LITD’s first Photo Trivia, I’ll do another one again soon! Mars Rover at brink of Santa Maria Crater taken from Overhead by Cassini and magnified many times. The lunar landing on the moon. lunar lander sorry for the error.